On November 12 at 1 pm, Art Gallery of York University AGYU hosts a symposium on the Centre for Experimental Art and Communication CEAC. CEAC was active in Toronto in the mid-1970s to mid-1978 when it closed. It rivaled A Space for the quantity, diversity, and interdisciplinarity of its programming. 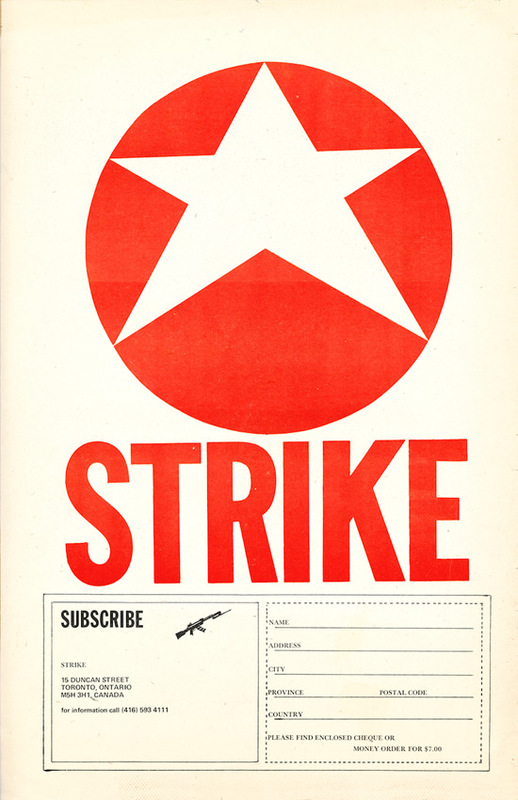 Its publication Art Communication Edition, later to become Strike, rivaled General Ideas FILE magazine, and was a vehicle for promoting the centres radical political program. When in the second-last edition, Strike advocated Red Brigade style knee-capping, a scandal ensued that ended CEACs fundingand lost its building, the first owned by an artist-run center in Toronto. Join the surviving original protagonists of the CEAC experimentDiane Boadway, Peter Dudar, Lily Eng, Bruce Eves, John Faichney, and Ron Giii along with Mike Hoolboom, Philip Monk, and Dot Tuer for a series of conversations on the forgotten history of and renewed interest in the Centre for Experimental Art and Communication. The symposium is held in conjunction with AGYUs fall exhibition Is Toronto Burning? 1977/1978/1979 Three Years in the Making and Unmaking of the Toronto Art Communitycontinuing until December 7, 2014. Is Toronto Burning? features the artists and collectives Susan Britton, David Buchan, Colin Campbell, Elizabeth Chitty, Carole Cond and Karl Beveridge, Judith Doyle, General Idea, Isobel Harry, Ross McLaren, Missing Associates Peter Dudar & Lily Eng, Clive Robertson, Tom Sherman, and Rodney Werden alongside archival documents, with a room devoted to the Centre for Experimental Art and Communication. The temptation, the irresistible lure, is to speak of CEAC as if it was a single thing, a single body perhaps. I hope to return to it as a choir of voices, you can decide whether they’re singing from the same playbook. After Mr. Calvino, let’s turn to Jearld Moldenhauer. Jearld: “In late 1970 I left Berlin where I had just found work and a place to live and traveled back to Niagara Falls, New York to attend my father’s funeral. Not having enough money to return to Germany, I took the bus back to Toronto and was ‘taken in’ by two gay friends. Once again I quickly found a job and a place to live. Amerigo Marras, a young artist from Sardinia, now an architecture student at the University of Toronto, and Suber Donald Corley, a draft dodger from Mississippi, now a high school teacher in Toronto, were advertising for a roommate. Their apartment was at 65 Kendall Avenue, only a block away from the Brunswick Avenue place where I was staying. It was in this apartment that I founded (out of a backpack) Glad Day Bookshop and where The Body Politic Collective meetings were held. The Kendall address was used for both. About seven-eight months later the couple bought a house (4 Kensington Avenue) in Kensington Market with the intention to turn the ground floor into an art gallery. They created a legal entity called the Kensington Arts Association and I was included as a ‘Board Member.’ Amerigo was quite a prolific artist and never stopped producing canvases. (Where are his canvases? He definitely had a strong and personal aesthetic spark. I hope some have survived.) We lived on the second floor of the house. The household included John Scythes (now owner of Glad Day). I met John one rainy night when he wandered into an early CHAT Dance, then held at the Holy Trinity Church. John more or less attached himself to me. He was searching for a way to come out and create a life away from his parents. For Don and Amerigo he was a welcome addition, since even in his early twenties John was a walking encyclopedia of construction/renovation procedures. The first version of Maurilia is a gay liberationist organization, it spawns a bookstore and a newspaper. The revolution may not be televised, but it will be printed. The Kensington Arts Association lived from 1970-75 in a pair of downtown Toronto homes that were converted to galleries, and from its very beginnings, as Jearld describes, it acts as a hub where a variety of activities can take place: publishing, art exhibitions, architectural interventions, group living, it was all part of an evolving political project. I would like to offer this speculation. That CEAC’s political project was, even in its earliest moments, conceived as a liberationist struggle that saw gay liberation, women’s liberation, black liberation, animal liberation, as a chained series of movements dedicated to the overthrow of colonial capitalism. The Kensington Arts Association was not the only group-home situation in downtown Toronto, in fact, collectives were the new normal. Why? In Canada the sixties happened during the seventies, and it was lent urgency by 60,000 young men who streamed across the border from the US, determined not to suit up for the war in Vietnam. And of course there were many thousands of American women who also came at that moment. They were young, educated, politically hip, and it is impossible to underestimate the effect they had on a growing Canadian art scene. Suber Corley was one of those 60,000 people. Here is Vtape co-founder Lisa Steele describing a teenaged moment back in Kansas City: “By the time we were planning to move up to Canada we were living in a hippie commune of three couples. Half were art students and half were liberal arts students going to university and part of Students for a Democratic Society… We were part of a Marxist group at that point, and then a Maoist collective. We did a lot of work around factories that were producing components used in arms.” I’m repeating Lisa’s words here in the hopes that you can hear echoes of some of what would emerge out of CEAC in a very short time. Marxist-Maoist collectives, anti-war, collective living, anti-establishment. The glue that held some of these liberationist struggles together was the opposition to the Vietnam War, and I’d like to suggest that some of the counterculture oppositional rhetorics, that CEAC for one would be taking seriously, took their cue from the daily war reports featured prominently in the corporate media. The language of war. In 1975 the KAA rebrands as CEAC (Centre for Experimental Art and Communication) and moves into an industrial building on John Street for about nine months. As an anti-capitalist project, the emphasis is on performance, film and video are shown, public discussions are held. But it is not a gallery where objects are manufactured and celebrated. The house slogan was: everything but the wall. If CEAC was interested in ideas, not objects, this is a revolution that would begin with the body, what else would a group of gay liberationists dream of but a new social body to accompany their new dreams? And how would this new body arrive? Perhaps via the radical work of Missing Associates Lily Eng and Peter Dudar who explored behavior as movement, and whose aggressively energetic repetitions reimagined the gallery as sparring arena or audience interrogation vehicle. Or in the decomposed structuralism of dancers like John Faichney, where single gestures are held and repeated over long periods of time, or Wyndham Wise and Richard Shoichet’s Spinning, where a man spins on the spot, for half an hour, or again in the earliest serial music of Steve Reich and Philip Glass, where note patterns or clusters are driven through a rigorous series of variations. In these moments the body could be examined, recomposed, repurposed. Repetition was the usual: say something once, why not say it again? In place of what Marras described as “the smoothness of the system,” here was art that was not so smooth, or slick, or entertaining. Here are, at least sometimes, dancers who are not dancers. We’re not part of the spectacle world creating objects that can be consumed and reproduced. Instead, the gallery returns as the most temporary of stages, where the new micro-relationships of the body, uncovered and demonstrated via serial repetition, break down the narrativized body (and along with it, presumably, the accompanying meta narratives of more is better or heteronormativity or useful labour). I would like to offer this hazy speculation, this vague idea. That the mechanics of capitalism, the operating gears of the system, were imagined to reside, like DNA, embedded within the body itself. I am capitalism, my movements are already parts of larger systems, I contain colonized universes that I am going to demonstrate and unravel using these new serial processes. In that same moment some artists were producing movies that were dubbed “structural film,” and these were animated by the central idea that capitalism was coded inside the machines of reproduction, inside the cameras, and filmstock and projectors, and that it was the task of movies to decode these mysteries and liberate its audiences. It was a practice that was deeply material and political at the same moment, and relied on duration, on new modes of long term attention that was able to track small changes over time. The audience was conceived not as a point of convergence, all of us nodding in time to the spectacle at hand, but instead the single artwork should produce a radical diffusion of response. And if everyone in the audience is seeing their own, very particular, entirely singular, version of the movie that’s being shown, underlying this hope is the old hippie dream that the cinema, or any contact encounter with art, would produce artists, instead of, for instance, consumers or spectators. And the production of artists via the decoding of capitalism embedded within our machines of reproduction or our bodily movements, is linked to the larger liberationist project of overthrowing capitalism itself. Or maybe I’m just making all that up. It’s interesting John’s use of this word “collection.” What else would an art centre have, but a collection? But what kind of collection would a Marxist, radical anti-capitalist group have, exactly? Artist’s books. At least in this case. A collection that is also a library, and one that they would be dedicated to adding their own words and pictures to. The strangeness of a collection held by non-collectors was not the only in-house contradiction. Suber Corley, for instance, was not living on the arts council dole, he had a real job, first as a high school teacher and then as a self-taught computer programmer. It was Suber who put up half the cash for the Duncan Street space, $55,000, the other half came as a matching Wintario grant. The CEAC were Marxist landlords who threw their arms open to the Liberal Party of Ontario (well, OK, the Party wasn’t paying as much as they should have been, and CEAC was stuck with their long term lease), along with the punks in the basement and the super 8 open screenings. In the summer of 1976, after just nine months on John Street, CEAC moves to 15 Duncan Street and begins programming in the fall. Riddle me this. Was there one CEAC at Duncan Street, or were there two? The first group (maybe possibly) was the one headed out to the performance art tours: Missing Associates, John, Ron Gii, Suber, Amerigo of course, Bruce and Diane. I’m probably forgetting names. But then along comes architect Roy Pelletier, and his pal Bob Reid, along with Paul McLellan, and they strike a different tone. Or do they? Here is Bruce Eves talking about the changing of the guard. Bruce: “It was with the second issue of Strike that the break happened. And with the break came a change in attitude. Peter Dudar said that the place was suddenly remote and closed off, the inner sanctum of the office was off limits and casual drop-ins were discouraged. His description sounds like another trope sort of unique to the 1970s — cults. The previous ironic acknowledgement of speaking from a privileged position within an art world had disappeared along with all sense of style. It was like a type of madness had infected the place.” The second issue of Strike, of course, is the one that brought the house down. This is the end of the usual CEAC story, the Toronto Sun headline, the mysterious phone call to John Faichney the morning before the newspaper appears asking him about it, the RCMP visits, the Globe and Mail cartoon, the arts councils unilateral funding withdrawals, the astonishing anti-CEAC fingerpointing signed by the entire art faculty here at York University, this is the endgame, right? Well, not exactly. Here is Saul Goldman remembering what happened next: “After the demise of CEAC there were three of us: Brian Blair, Paul Doucette and myself. We moved from 15 Duncan Street to a small space at 144 Front Street West… When the arts councils withdrew their funding the Duncan Street building had to be sold, but we still had equipment and a mandate to run the organization. So we moved into a temporary location on Front Street until we could find another building to re-invest the monies that we had made from the Duncan Street sale. We had to reinvest that money in a comparable property and it took us a while to find something.